Football...It's a world language. FIFA has more constituent members than the United Nations and the sport is played literally everywhere. From favellas in Brazil and townships across Africa, to the pristine grass fields of professional academies of Barcelona and Manchester United, football is loved by all. It has the power to supervene discrimination and removes any privilege as you are all seen as equals on the field. Image: Two Argentine players tackling a Brazilian player. So what does it mean to play the beautiful game? It is liberating, it provides a space in which everyone can relate and it allows you to be responsible for your team and vice versa. But are we aware of what it is like to live with a disability and not be able to enjoy the true merits of the game? Well for one, as an able bodied athlete and footballer, you take many things for granted. Despite injuries (a common occurrence) it passes us by to even consider what it would be like to play without a fundamental human necessity insofar as sight is concerned. This is almost as compromising as playing without a leg. It is seriously debilitating. However in the face of these obstacles, humans have really overachieved. Blind football is now a competitive sport in Paralympics with 5-a-side teams taking to the field and representing their countries. Each team has a fully sighted goalkeeper who directs play and this is done with a mastery which is truly awe inspiring. Everyone else on the team plays with blindfolds on as some are partially sighted, leveling the playing-field even further. The football even has ball-bearings which make a noise, helping players throughout the match. Big efforts have been made to ensure that blind football truly enables sportsmen and women alike to participate in a comradely and team ethic on the same level as their sighted equivalents. 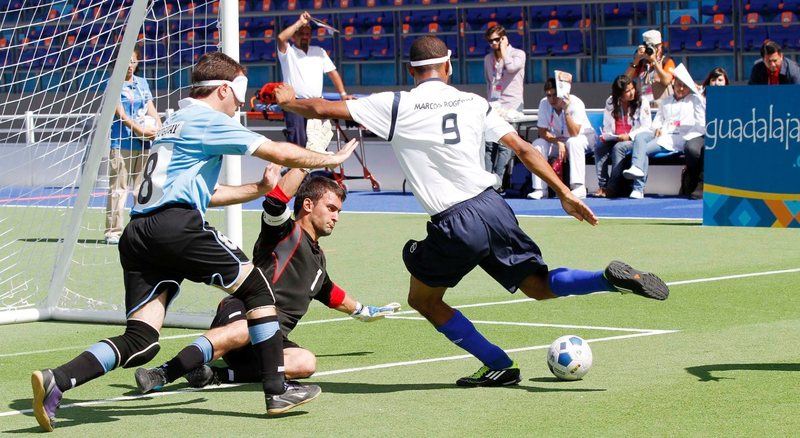 Image: A sighted goalkeeper blocking a shot taken by a blindfolded attacking player. I would go as far to say that all sighted football teams should train at least in some capacity with blindfolds on not only to appreciate how difficult it is to adapt but to teach communication, discipline and close control which otherwise would not be forthcoming. While there is still plenty room for growth, there is so much to be gained by blind football. I would advise anyone who suffers from visual impairment to find a team and join!